Mirra is an innovative blend of passive and active adjustments that provides a new reference point in performance, aesthetics, and value. Mirra automatically shapes itself to each user, while a few simple adjustments fine-tune the fit and feel. The chair's next-generation innovations, including the upholstered backrest, all work together in a fresh-looking chair that's easy to use. 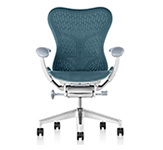 Herman Miller Mirra Chair Replacement Parts are available for chairs out of warranty. No adjustment needed. 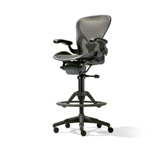 The pliable, elastic TriFlex back supports the entire spine and conforms to size, posture, and movements. Passive PostureFit performance. A camber shape at the base of the back gives healthful, comfortable support to the lower back below the beltline. Easy motion. The Harmonic tilt creates pivot points at the hip, knee, and ankle to allow easy and natural movement. Advanced spring technology. Users of all sizes feel equal resistance while moving anywhere in the wide tilt range; the sitter is always in control. AireWeave suspension. 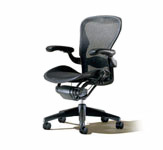 This elastomeric suspension seat follows the contours of the body, distributes pressure evenly, and provides aeration. FlexFront seat edge. The sitter adjusts the seat depth without moving the seat pan; there's never a gap between the seat and backrest. Innovative look. 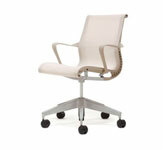 Mirra has a clean, light-scaled design that reveals the chair's features and function. Colorful choices. The backrest and seat suspension come in a range of colors that mix or match to complement interiors and other furniture. Traditional touch. 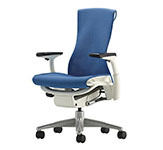 The back can be upholstered in foam-free Latitude fabric without adding bulk to the trim profile; Latitude is breathable and maintains the total support of the TriFlex back. Earth Friendly Sustainable design. Mirra is made of a minimal number of parts and is easily disassembled for recycling; the recycled content is high, and it's 96 percent recyclable. Sustainable design. Mirra is made of a minimal number of parts and is easily disassembled for recycling; the recycled content is high, and it's 96 percent recyclable. Recylable fabric. Latitude back upholstery is 100 percent recyclable. 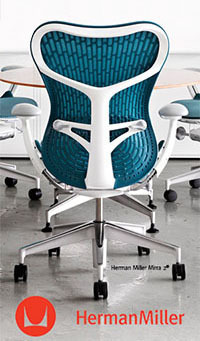 To create the Mirra chair, Herman Miller teamed with Studio 7.5, a German design firm. Composed of five designers--Claudia Plikat, Burkhard Schmitz, Nicolai Neubert, Carola Zwick, and Roland Zwick--Studio 7.5 has been involved for over 10 years in the design and development of products that improve the way people work. They consider themselves 'the grandchildren of the Eameses' and, like those pioneering designers, they are experts at observing how workers interact with their environments and finding ways to make that interaction more natural. 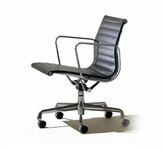 Sharing a genuine passion for seating, they know seating as a science and work to bring it to another level. Rather than relying on any individual in the firm, Studio 7.5 works as a team, without titles or hierarchy. 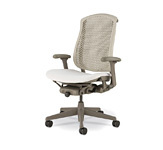 The Mirra chair is a product of their collective imagination, talent, and persistence--along with a willingness to break the mold in order to create a chair that sets a new standard for comfort, fit, balanced ride, and visual refinement in its price range. Studio 7.5 envisioned a chair that reacts to what people do. Part of the concept was to make the chair like a second skin, like a shadow of the sitter. From this concept, Mirra's passive adjustability was born. From the TriFlex back to the AireWeave seat suspension to the Harmonic tilt, Mirra does just what Studio 7.5 worked to achieve: Just sit on it, and it fits. There are only a few adjustment controls, and they are designed to be very intuitive. Mirra features common materials applied in original ways--such as the elastomeric seat suspension and molded polymer back that are used instead of foam and fabric. The relationship between materials and technology was optimized to achieve maximum performance with minimal materials. 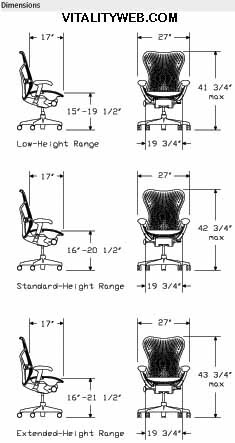 User testing, benchmarking, focus groups, tilt performance studies, and other methods were used to ensure the chair meets customer needs and provides advanced ergonomic performance. For example, research over the years has shown that the biggest concern users have is back support. In fact, back issues account for the second highest number of work illnesses. The designers took this to heart and focused on the back as an area of differentiation. Herman Miller and Studio 7.5 also used results from the Civilian American and European Surface Anthropometry Resource (CAESAR) study, which surveyed body measurements of people aged 18-65, using the latest 3-D technology. Data from the study--the first full-body, 3-D surface anthropometry survey of the U.S. and Europe--helped ensure the chair fits people from the 5th percentile woman to the 95th percentile man.